CFU1U provides an USB1.1 Host downstream port with your PDA. Enables you to enjoy various USB HID, Mass Storage devices and HUB with your PDA. You can treat big data, watch movie, listen music on your PDA. Add an USB 1.1 Host downstream port to your PDA. Certified with HP iPAQ and Dell Axim, expands your application and ideas of PDA based systems. Compatible with bar-code scanners, magnetic stripe card readers, keypads or other USB HID devices. 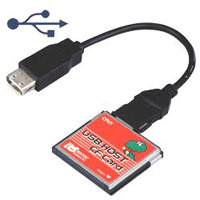 Supports USB Media Reader/Writers, Zip, MO and other USB Mass storage devices. Allows to backup data between PDA and Windows PC. Easy to install the driver via Microsoft ActiveSync. 100mA USB Bus-Power is available at the USB port, don't need AC adapters for Low-Power USB devices such as Keypads, Flash Memory Reader/Writers, Bar-code Scanners, USB Flash drive and Fingerprint Scanners. Fully compatible with USB1.1 HUB. Low power consumption allows long battery life. CF TypeII slot or PC card slot with CF TypeII adapter. *Notice: CF slot must support CF I/O function. Free ware driver for Linux Zaurus is available at Mr.Humorum's Page. If you have any questions or need any help, please ask the website. We can not answer anything. H3800 series PocketPC 2002 *Needs CF card Jacket or PC card Jacket. H3900 series PocketPC 2002 *Needs CF card Jacket or PC card Jacket. *The transfer rate is much slower than other PDAs. Refer to the FAQ about the transfer rate. Need to use "Polling Mode" driver under "WM5_PPC2003"folder in downloaded driver file. hx2410 PocketPC 2003 SE Need to use "Polling Mode" driver under "WM5_PPC2003"folder in downloaded driver file. PocketPC e740 PocketPC 2002 * *HID device only works with the e740. *Pocket PC 2003: Windows Mobile 2003 software for PocketPC. *1: Some media needs to be formatted at the first connection on PocketPC 2003. *2: Some PDA does not mount an USB device after power off and on with the device connected. 5V Vcc 27mA(Not included USB Bus power output current). 3.3V Vcc 34mA(Not included USB Bus power output current). iPod® is a trademark of Apple Computer, Inc., registered in the U.S. and other countries. Windows®, Microsoft ActiveSync®, Pocket PC 2000®, Pocket PC 2002®, Pocket PC 2003® and Windows Mobile 5.0® are registered trademarks of Microsoft Corporation in the US and other countries. All other products, services, names and registered trademarks are trademarks of respective companies.